This comment at Cryptogon made me laugh (remarking on a post about US airborne radioactivity experiments conducted on the unfortunate inhabitants of East St Louis during the 50s and 60s - Secret Cold War Aerosol Experiments on Poor, Minority Communities in St. Louis). Inhabitat has a post on the rapidly evolving field of 3D printers (with this one using bioplastic feedstock) - The KamerMaker 3D Printer Can Print Entire Rooms From Bio Plastic!. Dutch architecture firm DUS has developed The KamerMaker (RoomBuilder) – a 3D printer so large that it can create entire rooms! Dubbed by its creators the “world’s first movable pavilion,” the KamerMaker features an enlarged ‘Ultimaker’ 3D printing machine that is so big it’s actually capable of printing smaller pavilions. In fact, it is capable of printing objects as large as 7.2 feet by 7.2 feet by 11.4 feet. Not only that, but the large-scale 3D printer can produce objects made from corn bio-plastic. Reuters has a report on declining gas production in northern Europe - UK overseas gas imports to surge to $11 billion by 2015. Britain's natural gas imports from outside the North Sea will surpass domestic production by 2015 and add more than $11 billion to import costs as domestic supplies dwindle and Norway increasingly struggles to fill the gap, Reuters research shows. Estimates show that Britain's own gas supplies will fall from around 43 billion cubic metres (bcm) per year today to around 16 bcm in 2030 if they continue their average annual 5 percent decline since peaking in 2000, while demand is set to hold steady between 85 and 95 bcm. Britain was a net exporter of gas until 2004, but a steady decline in output over the last few years has made it more reliant on imports, which have so far mostly come from Norway and, increasingly, Qatar. The New York Times has a look at the jockeying going on in Greenland to try and extract resources from previously ice-covered lands - A Melting Greenland Weighs Perils Against Potential (via Smart Planet). As icebergs in the Kayak Harbor pop and hiss while melting away, this remote Arctic town and its culture are also disappearing in a changing climate. Narsaq’s largest employer, a shrimp factory, closed a few years ago after the crustaceans fled north to cooler water. Where once there were eight commercial fishing vessels, there is now one. As a result, the population here, one of southern Greenland’s major towns, has been halved to 1,500 in just a decade. Suicides are up. But even as warming temperatures are upending traditional Greenlandic life, they are also offering up intriguing new opportunities for this state of 57,000 — perhaps nowhere more so than here in Narsaq. Vast new deposits of minerals and gems are being discovered as Greenland’s massive ice cap recedes, forming the basis of a potentially lucrative mining industry. One of the world’s largest deposits of rare earth metals — essential for manufacturing cellphones, wind turbines and electric cars — sits just outside Narsaq. This could be momentous for Greenland, which has long relied on half a billion dollars a year in welfare payments from Denmark, its parent state. Mining profits could help Greenland become economically self sufficient, and may someday even render it the first sovereign nation created by global warming. “One of our goals is to obtain independence,” said Vittus Qujaukitsoq, a prominent labor union leader. But the rapid transition from a society of individual fishermen and hunters to an economy supported by corporate mining raises difficult questions. How would Greenland’s insular settlements tolerate an influx of thousands of Polish or Chinese construction workers, as has been proposed? Will mining despoil a natural environment essential to Greenland’s national identity — the whales and seals, the silent icy fjords, and mythic polar bears? Can fishermen reinvent themselves as miners? The Arctic is warming even faster than other parts of the planet, and the rapidly melting ice is causing alarm among scientists about sea-level rise. In northeastern Greenland, average yearly temperature have risen 4.5 degrees in the past 15 years, and scientists predict the area could warm by 14 to 21 degrees by the end of the century. Energy companies should not drill for crude oil in Arctic waters because the environmental risks are too high, Total SA Chief Executive Officer Christophe de Margerie said in the Financial Times on Wednesday. The newspaper described de Margerie's comments as the first time a major oil company has publicly criticised offshore exploration in the Arctic. The risk of an oil spill in such an environmentally sensitive area was simply too high, according to de Margerie. "Oil on Greenland would be a disaster. A leak would do too much damage to the image of the company," he said. This is a good idea - a public air pump for bikes - Need Air ?. Need air? 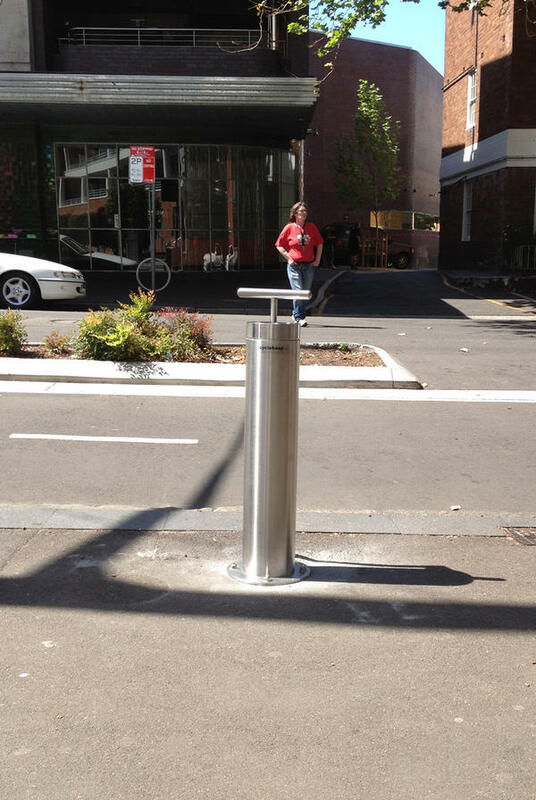 Here's our new on street bicycle pump on Bourke St, Surry Hills. More coming soon! The ABC has a post on a tidal power project in the top end - Northern Territory to test tidal power. The Power and Water Corporation in the Northern Territory has signed a Memorandum of Understanding with Tenax Energy to build a two-megawatt tidal energy plant and tidal energy testing centre. The project will be built in the Clarence Strait between Darwin and Melville Island and is expected to be operational within the next 15 months. Power and Water's manager for sustainable energy, Trevor Horman, says tidal power has the potential to provide a significant percentage of Darwin's electricity supply. "The idea with the testing station is to test out a number of different turbines and technologies in the Clarence Strait," he said. "With these turbines it's about the flow of the tide rather then the height. (The project) is reasonably close to an existing power line, so we'll give it a trial over a couple of years and see how the technologies work out there... but we do hope this will prove a safe, reliable and inexhaustible energy source." Power and Water says the region is one of the largest tidal resources close to a major centre, with a potential generation capacity of 450 megawatts. Darwin's current peak demand is about 300 megawatts. IEE Spectrum reports that a tidal power project has gone live in the US - First Tidal Power in U.S. Starts Flowing to the Grid. An offshore turbine is finally spinning in the United States! It's not the kind you're imagining, but this is a milestone nonetheless: The Ocean Renewable Power Company announced that its TidGen tidal turbines have started providing power to a utility grid owned by Bangor Hydro Electric Company. This marks the first time that any offshore power generation facility has fed electricity back to a utility grid in the United States. ORPC completed installation of one of its tidal power devices earlier this summer in Cobscook Bay, part of the bigger Bay of Fundy, off the Maine coast. The TidGen has a peak power output of 180 kilowatts, enough to power around 25 to 30 homes. The company plans on installing another two turbines in the same location in the fall of 2013, possibly scaling up after that to 5 megawatts of power. That would be enough to power around 1200 homes. The TidGen device, installed in water depths of 15 to 30 meters, takes advantage of water flowing in and out of the bay as the tides change. The Bay of Fundy as a whole is an enormous tidal power resource; ORPC says that 100 billion tons of water flow in and out of the bay every day, with tidal ranges as high as 15 meters. And tidal power has one advantage over, say, offshore wind energy, in that it is remarkably consistent and predictable. Ocean technologies in general are on the rise of late, such as the progress toward wave power in Oregon. Combined, wave and tidal power have fairly massive potential, up to as much as 15 percent of the U.S. electricity demand according to reports from the Department of Energy. Last year, a Georgia Tech group created a tidal power mapping tool that was validated by the DOE to aid in specific site development and localized resource assessment. The Reserve Bank has an interesting analysis of how crude oil is priced in world markets - The Pricing of Crude Oil. 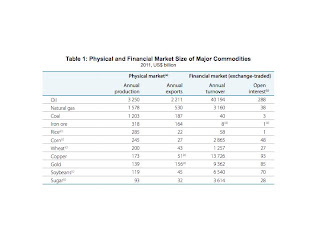 The crude oil market is significantly larger than that for any other commodity, both in terms of physical production and financial market activity (Table 1). The value of crude oil production is more than twice that of coal and natural gas, 10 times that of iron ore and almost 20 times that of copper. Crude oil is the most widely used source of fuel, supplying around one-third of the world’s energy needs. 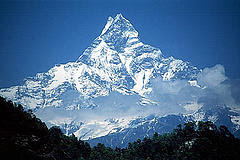 It is also used to produce a variety of other products including plastics, synthetic fibres and bitumen. Accordingly, changes in the price of crude oil have far-reaching effects. With so many different grades of oil, there is actually no specific individual market price for most crude oils. Instead, prices are determined with reference to a few benchmark oil prices, notably Brent and West Texas Intermediate (WTI) (Graph 3). Brent is produced in the North Sea and is used as a reference price for roughly two-thirds of the global physical trade in oil, although it only accounts for around 1 per cent of world crude oil production (Table 3). WTI is produced in the United States and has traditionally dominated the futures market, accounting for around two-thirds of futures trading activity. However, futures market trading in Brent has increased significantly in recent years to be now close to that for WTI, reinforcing Brent’s role as the key global benchmark (Graph 4). As discussed below, Brent’s dominance as a benchmark has benefited from the fact that it is a seaborne crude and, unlike WTI (which is a landlocked pipeline crude), can readily be shipped around the world. These benchmarks form the basis for the pricing of most contracts used to trade oil in the physical (and financial futures) markets. For oil transactions undertaken in the spot market, or negotiated via term contracts between buyers and sellers, contracts specify the pricing mechanism that will be used to calculate the price of the shipment. So-called ‘formula’ pricing is the most common mechanism, and it anchors the price of a contracted cargo to a benchmark price, with various price differentials then added or subtracted. These price differentials relate to factors such as the difference in quality between the contracted and benchmark crude oils, transportation costs and the difference in the refinery’s return from refining the contracted and benchmark crudes into the various petroleum products. For example, a barrel of Brent is generally worth more than a barrel of Dubai (a medium sour crude oil) because Brent will yield more high-value gasoline, diesel and jet fuel than Dubai without the need for intensive refining. However, the actual magnitude of the Brent-Dubai spread will depend on the relative prices of these petroleum products at the time when the oil is sold to the refineries, along with the location and the spare capacity in those refineries that can easily convert lower-quality crude oil into higher-yielding petroleum products. Reflecting changes in these fundamental determinants, the Brent-Dubai spread has fluctuated within a range of around US$0–15 per barrel. These benchmark prices used in formula pricing are usually based on either (i) ‘spot’ prices determined by PRAs (for example, a ‘spot’ price published by Platts called Dated Brent); or (ii) prices determined in futures markets (for example, the assessed WTI price published by the PRAs). Oil companies often reference more than one benchmark price depending on the final destination; for example, Saudi Aramco typically employs the Brent benchmark to price oil exports to Europe, Dubai-Oman for exports to Asia and the Argus Sour Crude Index for exports to the United States. These particular crudes emerged as benchmarks due to several distinctive characteristics. Brent developed as a benchmark owing to favourable tax regulations for oil producers in the United Kingdom, in addition to the benefits of stable legal and political institutions (Fattouh 2011). 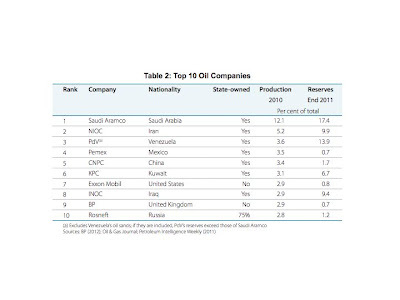 Ownership of Brent crude oil is well diversified, with more than 15 different companies producing it, which helps to reduce individual producers’ pricing power. Brent can also be used by a variety of buyers, given that it is a light sweet crude oil that requires relatively little processing. The physical infrastructure underlying Brent is also well developed. When the Brent benchmark was established in the mid 1980s, its production was initially reasonably large and stable, which is an important characteristic of a benchmark as it guarantees timely and reliable delivery. Although the volume of Brent crude oil produced has declined over time, three other North Sea crudes have been added to the Brent benchmark basket over the past decade, such that it now comprises Brent, Forties, Oseberg and Ekofisk (BFOE; Graph 5). The combination of these four alternatively deliverable grades has allowed the Brent benchmark to retain a reasonable volume of production. And while there are concerns about the adequacy of production volumes in the future, the depth and liquidity of the Brent futures market has nevertheless increased noticeably in recent years. If alternative crude oils cannot be delivered against a benchmark, declining production volumes can weaken the status of that crude oil as a benchmark. This is because it becomes a less accurate barometer of current supply and demand as it becomes traded less frequently, and lower traded volumes enable individual market participants to influence the price more easily. Malaysian Tapis – which was previously a key benchmark for the Asia-Pacific region – is a case in point. Tapis’s benchmark status has faded away in recent years owing to declining production volumes; recently, only a single cargo of Tapis has typically been available for export each month, down from around 8 cargoes per month in previous years. This compares with around 45 cargoes per month currently for the Brent benchmark. Declining production volumes, coupled with the absence of any alternative similar crude oils produced in the region, have seen refiners and producers shift to benchmark against other prices, predominantly Brent. The emergence of WTI as a benchmark was also assisted by the presence of secure legal and regulatory regimes in the United States. WTI was established as a benchmark in 1983 and its status increased in prominence as the depth and liquidity of its futures contract expanded. Like Brent, WTI is a light sweet crude that is available from a broad range of producers. Similarly, several different types of crude can be delivered against the WTI contract, including sweet crudes from Oklahoma, New Mexico and Texas, as well as several foreign crude oils. WTI crudes are delivered via an extensive pipeline system (as well as by rail) to Cushing, Oklahoma. Given that oil prices are essentially jointly determined in both the physical and financial markets, it is no easy task to disentangle the effect of each market in the price discovery process with any precision. Nevertheless, futures markets appear to play an important role in the pricing of oil, perhaps more so than for other commodities. 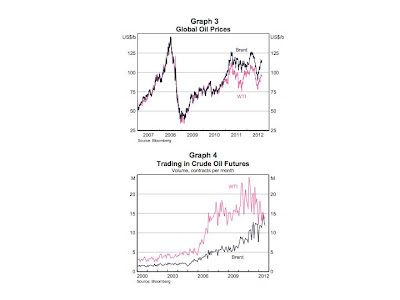 Indeed, there is a view that crude oil price levels are essentially determined in the futures market. This is clearest for WTI where PRAs identify the ‘physical’ price directly from the deep and liquid futures market, and where there is no significant parallel OTC market. It is less obvious, however, for Brent. While Brent forward prices are typically used by the PRAs to derive the Dated Brent price, as noted above Brent forward and futures markets are directly linked via EFPs. Many large oil market players reportedly hold Brent forwards and futures in their portfolios, arbitraging between the two instruments, such that the prices of Brent futures and forwards typically converge. The complexity of the oil pricing arrangements makes it difficult to demonstrate convincingly that benchmark oil prices fully reflect physical supply and demand conditions rather than the actions of uninformed financial speculators. Nevertheless, movements over time in the price differentials for the various benchmark crudes are broadly consistent with changes in demand and supply. 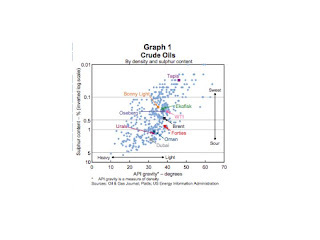 The Brent-WTI spread provides a good example of the influence of such factors on oil price differentials (Graph 6). Prior to 2011, Brent and WTI prices generally moved in tandem, with the spread largely reflecting the costs of transporting Brent-referenced crude oils to the United States. In recent years, however, increased volumes of crude oil from North Dakota and Canada have flowed into Cushing, leading to a build-up in inventories. Most pipelines flow from the rest of North America into Cushing, making it difficult to move the extra crude oil out of Cushing. This has led to persistent inventory bottlenecks, which have weighed heavily on the price of WTI over the past 18 months, leading the Brent-WTI spread to widen to US$10–30 per barrel. Bloomberg has a report on an EPA investigation into fracking for shale gas - Fracking Is Safe—Except in Wyoming. Louis Meeks, a hay farmer in Pavillion, Wyo., holds a mason jar under a faucet in his house and turns on the water. It’s a demonstration he’s given to a slew of neighbors and government officials. The water, drawn from his backyard well, is cloudy and smells like diesel. “Would you want to drink it?” he asks. Meeks blames the bad water on fracking, the process in which thousands of gallons of water are mixed with sand and chemicals and blasted underground to free natural gas. As we all know, coal is good for you - Beer from Coal. Business Week has an article quoting a Citibank analysis of Saudi Arabian oil export capacity - Saudi Arabia May Become Oil Importer by 2030, Citigroup Says. George Monbiot's campaign to have Tony Blair arrested for his involvement in starting the Iraq war is trundling along (with Desmond Tutu creating some added anti-Blair publicity recently) - Bounty Paid for Blair Arrest Attempt. On Tuesday the Arrest Blair campaign will pay Tom Grundy £2,400 for his attempt to arrest Tony Blair during a public event in Hong Kong. The 2003 Iraq war caused the deaths of between 100,000 and one million people, depending on whose estimate you believe. A series of leaked documents shows that the Bush and Blair governments knew they did not possess legal justification. Without it, the war with Iraq was an act of mass murder, committed by those who launched it. Though the former leaders of other states have been prosecuted under international law, none of those responsible for the Iraq war have yet been charged. The aim of Arrest Blair is to ensure that this illegal war is not forgotten, and to maintain international pressure for charges to be brought. The campaign, which was set up in 2010 by the journalist George Monbiot(4), encourages people to attempt non-violent citizens’ arrests of the former prime minister. Donations are made by the public to a bounty fund. When an attempt is judged to meet the Arrest Blair rules, a quarter of the money in the pot is paid to the person who carried it out. Tom Grundy’s attempt is the fourth that meets the campaign rules. Almost £11,000 has now been paid. PhysOrg has an interesting graphic showing vehicle fuel efficiency in the US - Vehicle fuel economy up for the first time since March. Average fuel economy (window-sticker values) of cars, light trucks, minivans and SUVs purchased in August was 23.8 mpg, the fourth-best month on record and an 18 percent increase (3.7 mpg) from October 2007, the first month of monitoring by UMTRI researchers Michael Sivak and Brandon Schoettle. The improvement from July to August—0.2 mpg—most likely reflects the increased price of gasoline, they say. In addition to average fuel economy, Sivak and Schoettle issued their monthly update of their national Eco-Driving Index, which estimates the average monthly emissions generated by an individual U.S. driver. The EDI takes into account both vehicle fuel economy and distance driven—the latter relying on data that are published with a two-month lag. Gizmag has an article on a new building material - Wood pulp extract stronger than carbon fiber or Kevlar. The Forest Products Laboratory of the US Forest Service has opened a US$1.7 million pilot plant for the production of cellulose nanocrystals (CNC) from wood by-products materials such as wood chips and sawdust. Prepared properly, CNCs are stronger and stiffer than Kevlar or carbon fibers, so that putting CNC into composite materials results in high strength, low weight products. In addition, the cost of CNCs is less than ten percent of the cost of Kevlar fiber or carbon fiber. These qualities have attracted the interest of the military for use in lightweight armor and ballistic glass (CNCs are transparent), as well as companies in the automotive, aerospace, electronics, consumer products, and medical industries. Cellulose is the most abundant biological polymer on the planet and it is found in the cell walls of plant and bacterial cells. Composed of long chains of glucose molecules, cellulose fibers are arranged in an intricate web that provides both structure and support for plant cells. The primary commercial source for cellulose is wood, which is essentially a network of cellulose fibers held together by a matrix of lignin, another natural polymer which is easily degraded and removed. The SMH reports that Malcom Turnbull is taking a few discreet (and well deserved) swipes at idiot Liberal party leader Tony Abbott - Honesty is the best policy: Turnbull swipes at state of politics and 'deficit of trust'. It remains a mystery to me how Abbott can actually have a lower approval rating than PM Julia Gillard and still remain Liberal leader - the country will be a complete laughingstock if he's still in place after the next election (which I expect the Liberals will win in spite of his presence). If you love your country, have an interest in politics or policy, and care deeply about our nation's future, there's nothing more certain to arouse your fury and invite your contempt than listening to an entire House of Representatives question time. Delivering a lecture in Perth last night, Mr Turnbull said it was an inescapable fact that greenhouse gases caused the earth to warm. "Politicians and shock jocks, scientists and coal barons, all of them can argue for as long as they like, but they cannot change the physical reality," he said. "I won't linger on climate change – the hopeless, confused, hyper-partisan nature of the debate is too well known to rehearse." Technology Review has a look at the double whammy the US drought and ethanol production are applying to corn exports - Corn Exports Shrivel as U.S. Ethanol Demand Grows. As an increasing amount of U.S. corn is being used to meet rising ethanol demand, the United States—the world’s dominant producer and exporter of corn—is exporting less. The first chart shows how the use of U.S. domestic corn has changed over time. The portion of U.S.-grown corn used to make fuel reached 40 percent last year, and will be about the same this year, according to the U.S. Department of Agriculture. At the same time, the worst drought in half a century throughout the Midwest corn belt has led to severely shrunken forecasts for this year’s United States corn crop, raising concerns that exports will further decrease, intensifying the risk of an international food crisis. The second chart shows the annual U.S. corn exports since 2005. Though the number of U.S. acres planted with corn was the highest since the late 1930s, this year, U.S. exports have been on a steady decline, dropping from over 60 percent of the world’s corn exports in 2005 to less than 40 percent last year. Climate Skeptics To Sink Through The Disappearing Sea Ice ? Stuart at Early Warning has a look at the likely point where arctic sea ice disappears completely during the northern summer - More on Arctic Sea Ice Volume. Following up to yesterday's quick lunchtime ice volume post. This morning I processed the data a bit differently by computing the average for each month in each year and then plotting the monthly series separately. The results are above. For the months July-December I fit a quadratic - which gives a decent fit in all cases. 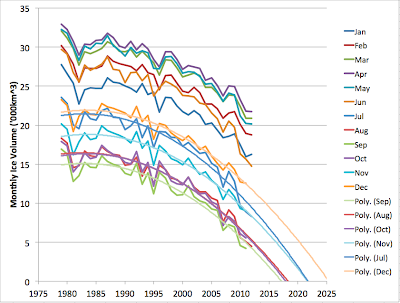 The extrapolations show the Arctic ice free for six months out of the year by 2025. There is no particular theoretical basis for the curve used as a model. The model has a lot of parameters (so that it has the opportunity to fit tightly in the sample period but go haywire outside of it). The extrapolation goes for a long way relative to the interval over which there is data. There is reason to suspect the underlying dynamics of the system might change during the extrapolated period. The underlying data are suspect, particularly if there are systematic errors that the fit is sensitive too. In this case, we have no theoretical model - this is purely an empirical fit. (The theoretical models of the Arctic are climate models, which uniformly failed to predict the rapid and early collapse in sea-ice volume that has actually been observed - so they are presumably missing something important about the dynamics). On the plus side, we only have three parameters - a quadratic is the simplest possible model of an accelerating process, and this process is clearly accelerating. Furthermore, the quadratic gives a decent fit for all months, it's not just a fluke that it happened to fit in September. The resulting extrapolations tell a fairly consistent plausible story: ice will disappear first in September, with October and August very close behind, and then November and July, followed by December. For the extrapolation interval, it appears to be quite short for August - October - around 15% of the data interval. We don't need the system to keep behaving the same way for very long at all in order for the extrapolated curve to go to zero. For the succeeding months the extrapolations obviously get more and more speculative. We don't particularly have any reason to expect the dynamics to change soon. The Arctic has long been expected to warm dramatically under climate change, and all indications are that it has indeed been warming and will continue to warm. There is no historical evidence of climate fluctuations this large in Arctic ice. However, it's possible that part of the recent move is a fluctuation that could revert and delay the inevitable. In particular, look at the recovery in ice volume in the early 1980s - a similar recovery in the next few years could push things out by a decade. 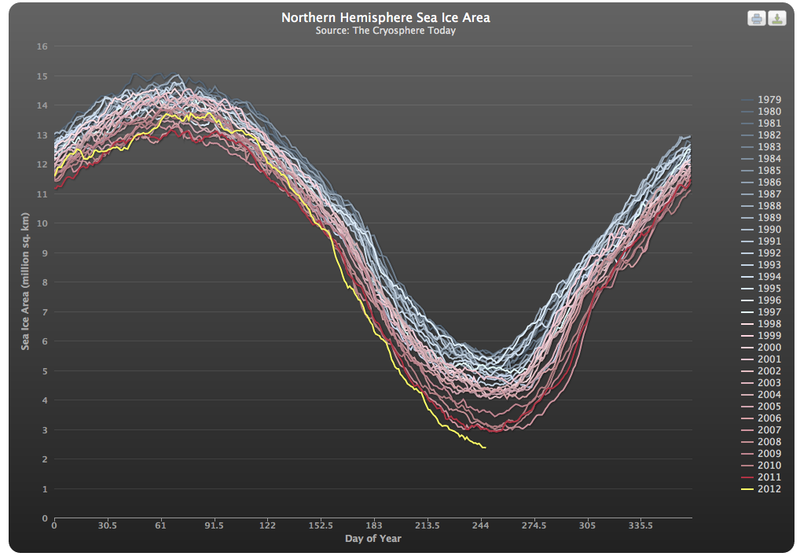 This was a follow up to an earlier post - Arctic Sea Ice Volume.